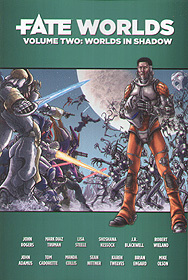 Fate Worlds Volume Two: Worlds in Shadow is the second in a two-volume set. In Worlds in Shadow, you get six rich story settings. Each setting includes custom mechanics, NPCs, and story elements - all ready to go using the system provided in Fate Core. We've got you covered regardless of your flavour of RPG choice. Be a knight in a giant robot suit in Camelot Trigger, or get on the grift with CrimeWorld. Fight off alien invaders in the court of Louis XV in Court/Ship, or indulge your time travel fantasies in Timeworks.